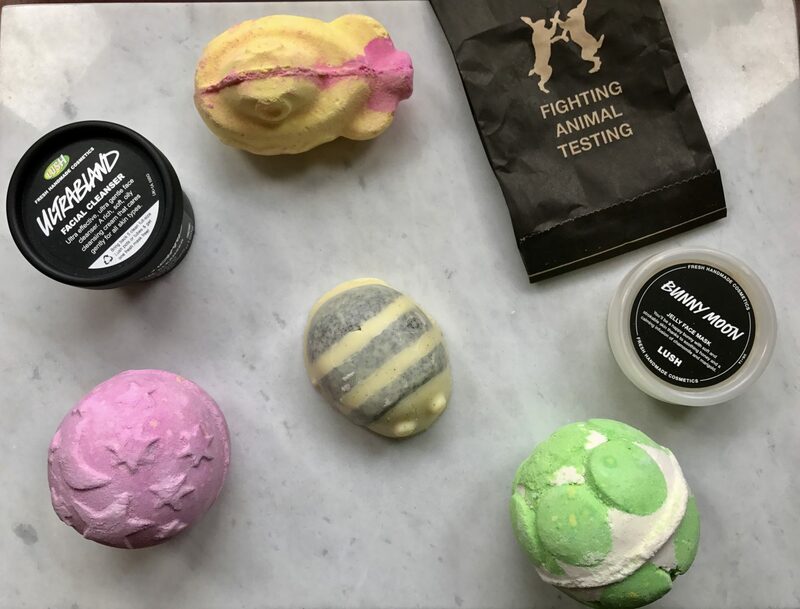 So the other day I popped into Lush to treat myself to a few new bits. I recently moved house, and for the first time in over 2 years at uni I finally have a bath again! Obviously this meant one thing- I need bath bombs. I feel like I’ve been reasonably restrained, I could have done a lot more damage but I’ve decided to wait to stock up again around Halloween. I went for the one of the new releases, I’d seen the new Jelly Face Masks advertised on instagram and they looked like something I would like, there are 5 to choose from and they vary in terms of which skin type they suit. I went for Bunny Moon, a hydrating mask aimed at normal to dry skin. The lady said to use a small pea-sized amount and work it into a paste in dry hands before applying. This smells gorgeous as it contains honey, and is also self preserving so has a better date than the fresh masks. Next up, more skincare. I’ve been wanting to try the Ultrabland cleanser for a while. The lovely girl who served me spent time showing me how I could use it to remove my makeup, it can be used as a makeup remover or as a second cleanse and this stuff smells amazing (like all Lush products). Onto Bath Bombs. I went for some new products again, first up Yellow Submarine. Apart from this being Beatles inspired which is pretty cool, it also smells quite orangey so a nice summer option, I imagine it also turns the water a pretty colour due to it being two toned. 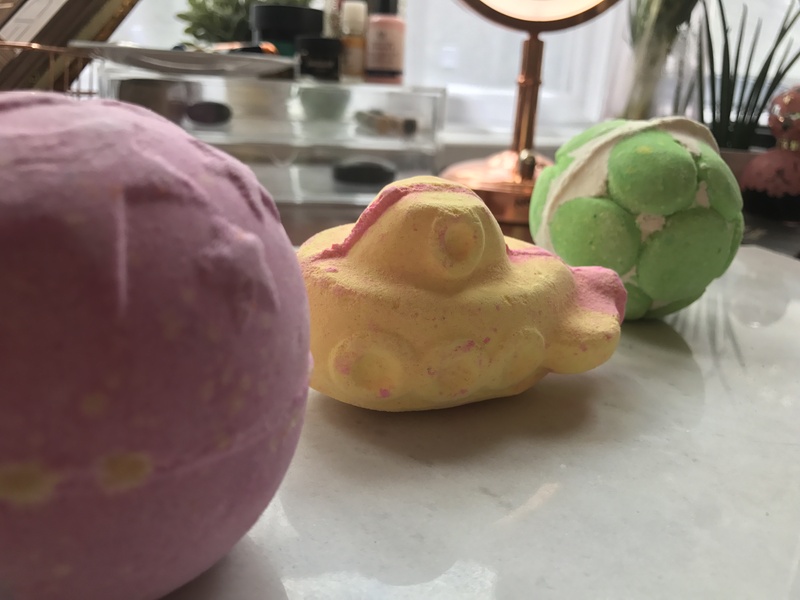 Next up, Green Coconut Jelly Bomb, this one is interesting because the green pods burst into jelly and make the top layer of your bath a little slimy in texture- which is very moisturising. Again the lady in the shop demonstrated this for me, she told me that the sliminess disappears in around 20 minutes so it’s a good one to soak in for a while. This next one I didn’t buy for myself, my lovely housemate Amy treated me to a Twilight bath bomb (one of my all time faves) for running her to the garage for her car this week. This one makes your bath look so cool, despite the pink exterior it contains a few colours which turns the water purple. This is a sweet scent but a nice one for nighttime, Thanks Amy! Finally I picked up Scrubee, this cute little body butter/scrub has made it’s return after a limited edition stint earlier this year. This little bee, helps moisturise your skin and gently exfoliate too. It smells to me like honey and vanilla, with a hint of Cocoa Butter and Almond so really nice and gentle. Overall I’m really pleased with my little splurge and hopefully the are all things I will enjoy, let me know if you’ve used any of these products and how you got on with them in the comments below! This all looks sooo nice! Hahaha I suppose some of their stuff does smell good enough to eat! Oooooh good to know it’s such a weird feeling haha, I love that one too!